This week’s topic is The Biggest Loser, and while I haven’t seen it yet I look forward to watching it this season. Episodes are piling up on the DVR so I’m sure I’ll watch them when I return home. Do you watch The Biggest Loser? And if so, what do you like/dislike about it? 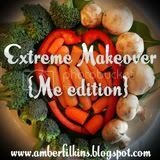 If you want to take part in EM:ME, just head over to Amber’s blog for details. My progress this week has been decent. I lost 1.2 pounds at my last weigh-in, but I won’t attend my regular weigh-in Thursday because I’ll be out of town. I have lost some inches since last time I was measured at the gym, and I’m wearing pants that are a size smaller. I need to exercise more than I have this week, but I’ll be sure to do that so I can look forward to my weigh-in next week. And I’ll miss the awesome people at my WW meeting this week, but I also plan to enjoy this special trip with a big part of my family. Have a great trip Kenz! I know you are going to do great this week. You know how to make good choices but also treat yourself when you need to. And remember….last time you took a trip you LOST weight! That's great! You're doing wonderful! Yes, I agree with Connie!! Maybe this time you'll lose too! I think you're doing awesome, Kenlie! And losing inches and wearing a smaller size are proof of that! !